Participants at a recent Wingspread conference on civic engagement in higher education concluded that while the movement has created some change, it has also plateaued and requires a more comprehensive effort to ensure lasting commitment and institutional capacity. For the participants at Wingspread, and for others involved in civic engagement in higher education, the time has come for “calling the question” of whether engagement will be viewed as a core value of the university of the 21st century – as centrally important to the civic mission of higher education and to generating and transmitting new knowledge. 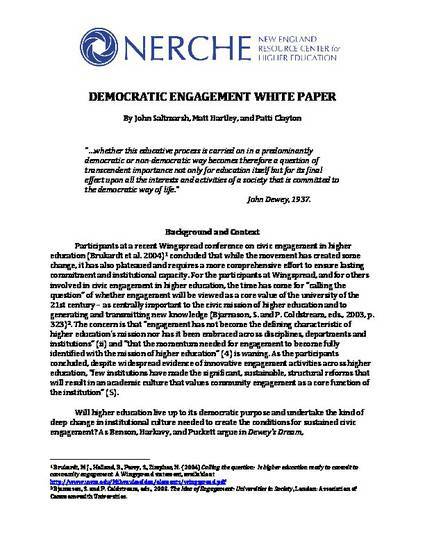 The concern is that “engagement has not become the defining characteristic of higher education's mission nor has it been embraced across disciplines, departments and institutions” and “that the momentum needed for engagement to become fully identified with the mission of higher education” is waning. As the participants concluded, despite widespread evidence of innovative engagement activities across higher education, “few institutions have made the significant, sustainable, structural reforms that will result in an academic culture that values community engagement as a core function of the institution." Will higher education live up to its democratic purpose and undertake the kind of deep change in institutional culture needed to create the conditions for sustained civic engagement? While we alone are accountable for the interpretations and analysis offered here, the basis for our understanding of the civic engagement work in higher education is a result of the invaluable contributions of the participants at the meeting that took place at the Kettering Foundation, February 26-27, 2008. No, this is not community-engaged.